Want to understand the Maillard Reaction like a chemist? So do we, but who’s got time for that? Instead, here’s our quick guide to understanding why a beautifully brown, intensely seared steak tastes so bloody good! 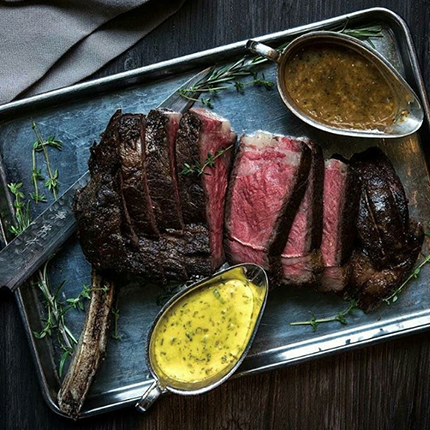 Image: Our Rangers Valley bone-in wagyu courtesy of @aberdeenstsocialhk on Instagram. Beautiful! We all love a beautifully brown, intense sear on our steak. But why? Because it tastes incredible we hear you say. Well, yes, undeniably it does. But why does it taste so good? It’s something called the Maillard (pronounced may-YAR) Reaction and it’s one of the most important reactions that occurs in cooking. You’ll be very familiar with the Maillard Reaction, even if you’ve never heard of it before. It’s the brown crunchy crust on your bread, the crispy golden edges on your roast potatoes, the magic that turns your toast, well… toasty. In its simplest form, the Maillard Reaction is a series of chemical reactions between amino acids (from proteins) and carbohydrates (sugars) that happen when food is cooked. So, you could say that this is the most widely practiced chemical reaction in the world. But as common as this reaction is in everyone’s kitchens, it’s actually really complicated. You see, the reaction doesn’t just occur with the amino acids and carbohydrates and stop there. It gets exponentially more complicated. The molecules produced continue to react in more and more complex ways, generating hundreds and even thousands of different molecules. And it’s these new molecules that make our steak look, smell and taste so delicious. The process changes the pigments in the steak by arranging them in collections of rings that reflect the light in a way that gives the meat its brown colour. The new molecules also release potent aromas that make our mouths water. This is all well and good, and somewhat fascinating, but how do you use this to your advantage? How do you get the best sear of your life? Two things… temperature and dryness. Lets break it down for you. 1/ High temperature cooking speeds up the reaction because heat both increases the rate of the chemical reactions and accelerates the evaporation of water. The Maillard Reaction only begins to occur over 140oC. 2/ Your food needs to be dry. It’s pointless trying to achieve the Maillard Reaction if your food is wet, because no matter how high the temperature, if there’s moisture around, it won’t climb to above boiling water point (100oC). The reverse searing technique capitalises on these two things to achieve a beautifully cooked steak. Cooking the steak low and slow in the oven dries out the surface of the meat. Finish it in a seriously hot pan to bring on the Maillard Reaction, and BOOM!, you’ve achieved an amazing, intense sear. You’re welcome. If you’d like to learn more about reverse searing, check out our earlier blog here for our step-by-step guide.